By Dan Horowitz- Long before Academy-Award winning actress Angelina Jolie stunned the world by undergoing a double mastectomy in May after learning she had the “Jewish gene”, Canadian journalist Libby Znaimer was all too familiar with BRCA mutation. In 2006, Znaimer, like Jolie, tested positive for BRCA2, a genetic mutation that increases the likelihood of developing breast, ovarian and pancreatic cancer. The mutation is especially common among Ashkenazi Jewish women, increasing a woman’s risk of breast cancer by 60 to 80 percent. The journalist and broadcaster with CP24 successfully battled the cancer, and again defied the odds in 2008, when she beat pancreatic cancer – a disease with a frightening five-year survival rate of approximately six percent. 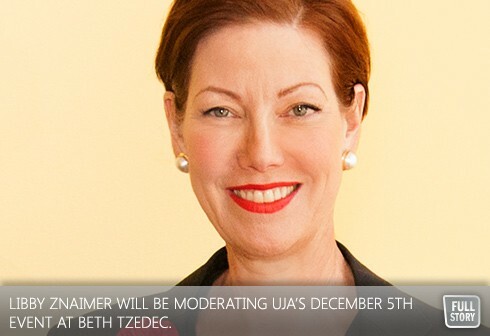 On Thursday, December 5th from 7:30 pm – 9:00 pm at Toronto’s Beth Tzedec Congregation Znaimer will be moderating a unique and important United Jewish Appeal of Greater Toronto panel discussion featuring three of Canada’s leading physicians, called “The ABCs of BRCA”. The event will focus on the BRCA1 and BRCA2 mutations, and the effects they have on Jews of Ashkenazi descent, while examining the current state of BRCA cancer research, genetic testing, risk assessment and more. Click here to register online for this important event, or RSVP to Glenda Gomperts ggomperts@ujafed.org or by phone at 416-631-5707.